One of the places Jeremiah and I eat out at a lot is Chipotle. On more than one occasion, we have tried to make our own at home. I also was telling Jeremiah about these amazing black beans and rice I had eaten at the Culinary Center of Kansas City. I was convinced they used chicken broth and I could try to replicate the flavor at home. This was our attempt last week and trying to replicate both these tasty dishes. Although we thought the Carne Asada had really good flavor, making it along with rice, beans, guacamole, and Pico from scratch made quite a mess to clean-up. Sometimes, it’s just easier to go out and stand in line. In a small bowl, mix spices. Then, stir in oil. Rub half of mixture on each side of the steak. Mix together remaining ingredients. Spray Crockpot with nonstick spray. Pour in half of juice mixture. Place in steak and pour over with remaining juice. Cook on low for six hours. Rise black beans. For beans in sprayed Crockpot. Cover with 1 cup of chicken stock and enough water to cover by two inches. Add in onion, garlic, and seasonings. Cook on high for six – seven hours. I put together a few recipes to make this dish. I cooked them for 4 hours. They were still a little hard so I kept cooking them. My husband thinks we should have soaked the beans for 24 hours and then they would have cooked in 3 ½ to 4 hours. A few month ago, Susan G. Komen for the Cure added a health recipe section to their website (click here for Komen recipes). One of the reasons is because living a healthy lifestyle (exercise and maintaining a healthy weight) can help reduce your risk for breast cancer. As someone concerned about these things, I decided to give a few of the recipes a try. This is one I just made for my co-workers. Preheat oven to 350 degrees. Using cooking spray, coat an 8X8 baking pan. Add all ingredients into a food processor except for the beans and blend. Add the beans and blend thoroughly. 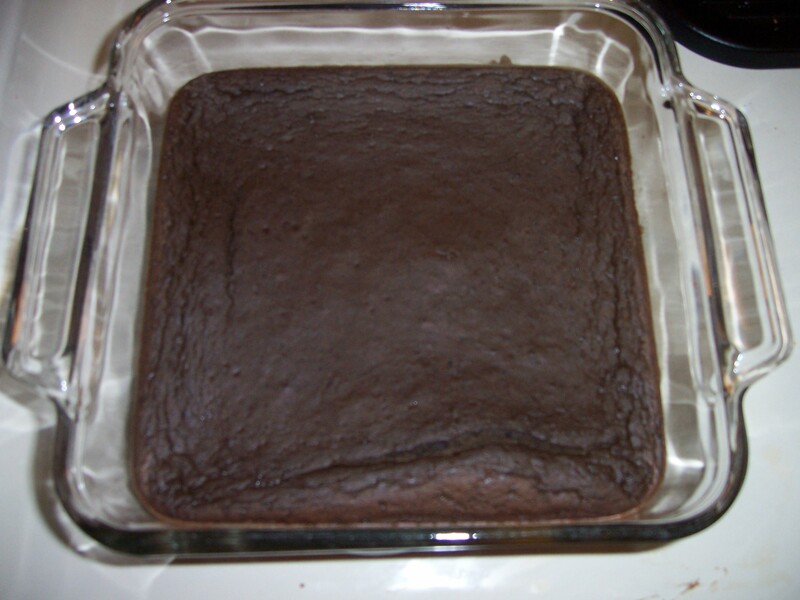 Pour brownie batter into the baking pan and bake for 30 minutes or until an inserted toothpick comes out clean. Let the brownies cool before cutting. Nutrition (per serving – 16 servings) Calories: 79 cal, Total fat: 3g, Saturated fat: 1g, Monounsaturated fat: 2g, Cholesterol: 53mg, Sodium: 46mg, Potassium: 126mg, Carbohydrate: 9g, Fiber: 3g, Protein: 4g. Although it didn’t really taste like black beans, I did find the sugar substitute to leave a little bit of an after taste. Just be aware if you don’t normally drink diet pop (soda). They are very moist but without preservatives get moldy quickly. If you don’t eat them in three or four days, be sure you keep them refrigerated. My friend Michelle and I go way back. She was one of my first friends in Kansas City. I don’t remember what classes we had together but I know we met in graduate school at the University of Missouri – Kansas City. We were both working on our Masters in Public Administration. Like me, she loves to cook and enjoys great food. When she first moved to Kansas City, Michelle nannied for people who were great friends with some of Kansas City’s best chefs. Needless to say, she introduced me to a couple of great places in town. Michelle loves Brookside so she took me to a lot of great places by UMKC – Aixois and Bella Napoli to name a few. Michelle also used to host dinner parties at her apartment where everyone would bring different dishes based on a theme like “Caribbean”. A great way to sample a lot of new recipes. Last fall, Michelle invited me to her new house for dinner and to help handout Halloween candy. This recipe is what she made for dinner. It’s from one of her favorite food blogs – The Smitten Kitten. One of the things I love about Michelle is her willingness to try adventurous recipes. Although this recipe isn’t pretty in appearance it is quite delicious. 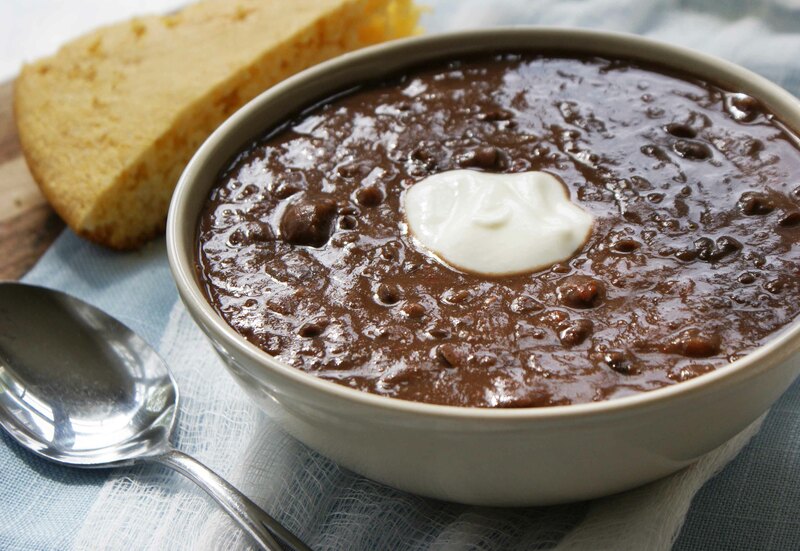 A hearty, healthy recipe for soup made with black beans, pumpkin, tomatoes, and onions. In a food processor, puree beans and tomatoes. In a stock pot/Dutch oven, cook onion, shallot, garlic, cumin, salt, and pepper in butter over moderate heat, stirring, until onions is softened. Stir in bean mixture. Add broth, pumpkin, and Sherry until well combined. Simmer uncovered, stirring occasionally f0r 25 minutes, or until thick enough to coat the back of a spoon. Just before serving, add ham and vinegar to soup, stirring, until thoroughly heated. Makes 9 cups. Note – We ate this with crackers and corn bread muffins. Original recipe suggest sour cream or pumpkin seeds.